Right now the front of your brain is firing signals about what you’re reading and how much of it you soak up has a lot to do with whether there is a proper balance of neurochemicals and growth factors to bind neurons together. Exercise has a documented, dramatic effect on these essential ingredients. It sets the stage, and when you sit down to learn something new, that stimulation strengthens the relevant connections; with practise, the circuit develops definition, as if you’re wearing down a path through a forest. I’ve talked about how different I feel after yoga or a long walk; things become clearer and I become calmer. 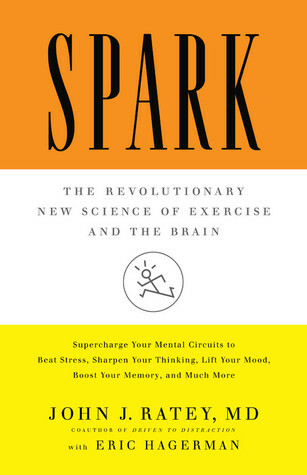 The fascinating book Spark: The Revolutionary New Science of Exercise and the Brain, by John Ratey, explains biologically what accounts for these significant changes in our mind and body. This is your brain on exercise. … physical activity sparks biological changes that encourage brain cells to bind to one another. For the brain to learn, these connections must be made; they reflect the brain’s fundamental ability to adapt to challenges. The more neuroscientists discover about this process, the clearer it becomes that exercise provides an unparalleled stimulus, creating an environment in which the brain is ready, willing, and able to learn. Aerobic activity has a dramatic effect on adaptation, regulating systems that might be out of balance and optimizing those that are not – it’s an indispensable tool for anyone who wants to reach his or her full potential. Exercise can have a dramatic affect on our ability to learn. Darwin taught us that learning is the survival mechanism we use to adapt to constantly changing environments. Inside the microenvironment of the brain, that means forging new connections between cells to relay information. When we learn something, whether it’s a French word or a salsa step, cells morph in order to encode that information; the memory physically becomes part of the brain. Researchers found that if they sprinkled BDNF onto neurons in a petri dish, the cells automatically sprouted new branches, producing the same structural growth required for learning. Spark goes into detail regarding the types of exercise that best produce this cocktail of neurotransmitters and proteins for your brain to sip on but at the end of the day any movement is good, especially if it’s something you want to do. So next time you get in a bit of a rut or you simply want to maximize your potential, get up and get moving.